California is one of the hot-zones in the world's urban housing crisis, driven by a combination of opposition to highrise/high-density living and the mass purchase of foreclosed properties following the 2008 crisis by giant Wall Street landlords who have steadily ratcheted up rents and evictions in a big to safeguard the flow of payments to bondholders who get a share of the rents extracted from struggling tenants living in dangerous, substanding housing. California's cities have different policy levers they can yank on to address this: zoning changes, commuter rail, school spending. But one lever that cities have relied upon since the beginning of modern urban government is missing: rent control. California state law forbids rent control on single-family homes; and apartments build after 1995. 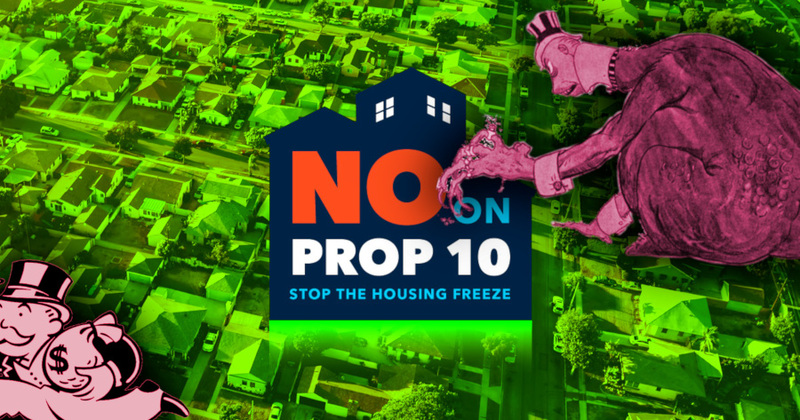 A ballot measure, Prop 10, will allow cities to impose rent controls on all rental stock, allowing voters a say in the way that their cities are developed. But the giant hedge funds that own hundreds of thousands of California rental properties are pumping millions more into scare-campaigns intended to convince voters to oppose Prop 10. Blackstone, the largest private equity firm in the world, is California's biggest corporate landlord, with 127,000 single-family homes in its "portfolio." They're responsible for $6,859,747 in anti-Prop-10 spending, part of the $45m attack on the proposition. Landlords across California have sent eviction notices to their tenants giving them 60 days to leave; other have announced massive rent increases -- and tenants have been notified that these will be cancelled only if Prop 10 fails. To put the nearly $7 million investment into perspective, Blackstone CEO Stephen Schwarzman earned $786 million by himself in 2017. Though Wall Streeters have begun to swing their donations toward Democrats in 2018, Schwarzman has put millions into Republican campaigns and was a key adviser to President Donald Trump, chairing his CEO policy council until it was disbanded after the 2017 white supremacist rally in Charlottesville, Virginia. Schwarzman’s company has bet big on real estate: It currently possesses $119 billion in assets, and a new fund is expected to generate another $18 billion in capital for more purchases. Blackstone has spent around $10 billion for its single-family home portfolio, “in a classic case of disaster capitalism,” according to Steve Ducey of DSA’s Los Angeles chapter.